Our ‘Canine Creche’ design allows for proper socialization and interaction between dogs and people. You can be assured your dog will go home at the end of the day content and happy. Doggy Day Care provides an outlet for your dog to release built up energy and excitement. This can help reduce unwanted behaviours caused by long periods of isolation and boredom. Capel Canines is run by Kieran Moore & Charlotte Brownlee. A massive love for dogs and a passion to ensure dogs are cared for and stimulated are the reason Kieran & Charlie got involved. Our owners took over the business on the 1st October 2018 and have already made significant changes and improvements to the business. The Centre is located in the village of Capel St Mary with very easy access to Ipswich and Colchester via the A12. We provide fully supervised Doggy Daycare in our Daycare Centre. Our services are for customers in Ipswich, Colchester and surrounding areas. 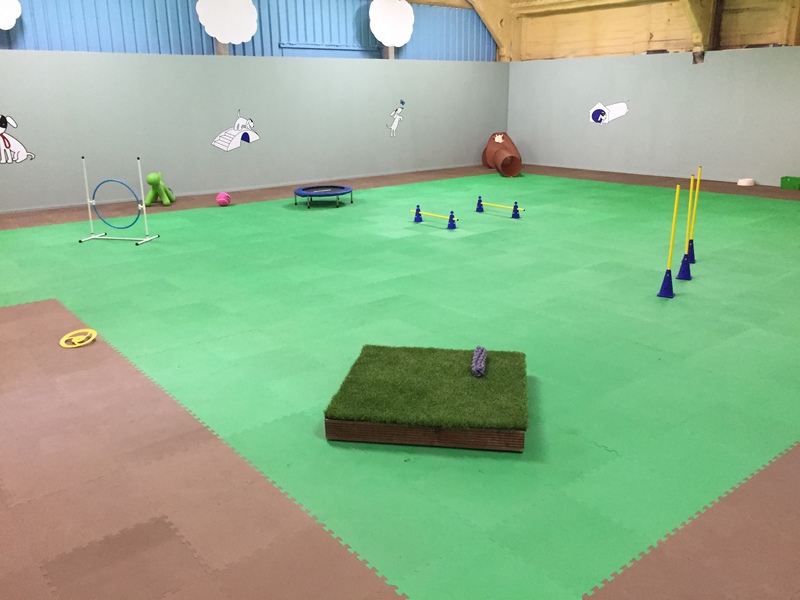 At Capel Canines our aim is to create an engaging and stimulating environment for your dog in a controlled and structured setting. The Capel Dog Grooming Company is based next door and they can offer a professional grooming service in their fully equipped Dog Grooming Parlour. Follow the links above to find out about all the services we offer. Alternatively you can contact us directly or pop in for a chat. We look forward to hearing from you. Everyday is different here, however most days start with burning off some of your dogs built up energy. Our large secure unit allows for dogs to run and play safely. Games such as Fetch, Tug of War and mini agility are available for your dog everyday. We interact with your dog and integrate your dog into the pack each morning to ensure correct socialisation. We do not keep your dog playing and running all day. Its important that every dog has the opportunity to switch off and relax during the day too. We have a break around 11am in our comfy lounge area, beds and sofa are always available for your dog. Some background music and dim the lights for a quick nap. In the afternoon its back out into the main unit for more fun filled options. We often do a treat hunt in the afternoon and try to stimulate your dogs senses. Occasionally we may provide some one-2-one training should you wish us to. We are passionate about your dog and all of our staff here at Capel Canines love and care for each of them like one of their own. This is your fifth home widget box. To edit please go to Appearance > Widgets and choose 14th widget from the top in area 14 called Home Widget 5. Title is also manageable from widgets as well.